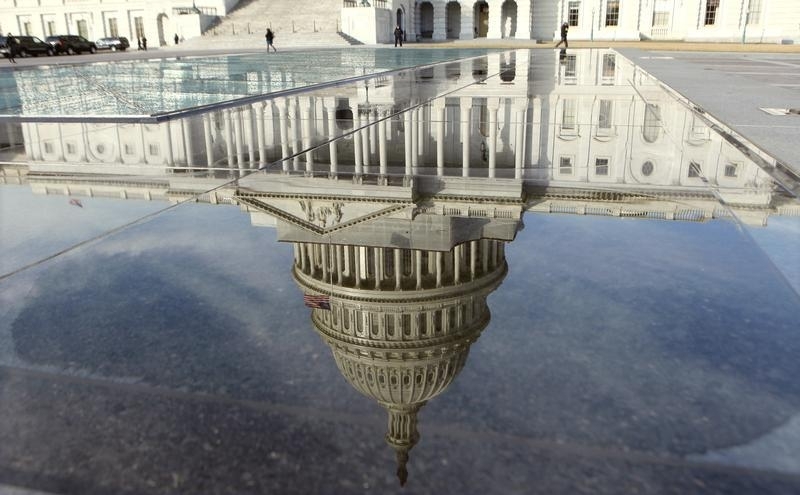 The dome of the Capitol is reflected in a puddle in Washington February 17, 2012. The U.S. House of Representatives passed a bill on Jan. 18 to extend federal government funding through Feb. 16. As of midday on Jan. 19, it remained unclear whether the Senate would pass the measure. Current funding is due to expire at midnight EST on Jan. 19. If a short-term measure is not passed before then, the federal government will partly shut down. A shutdown lasting more than one day has occurred only four times in the past 30 years, with the most recent coming in 2013. Republicans have majorities in both chambers of Congress but require Democrat support to pass funding measures in the Senate. Funding measures have been caught up in a heated debate on immigration, among other things. Democrats are pushing for legal protections for recipients of the Deferred Action for Childhood Arrivals program, an Obama-era initiative protecting from deportation some 700,000 individuals who entered the country illegally as minors and are not yet permanent residents. The administration of President Donald Trump announced n September that DACA recipients will start to lose protection from deportation in March 2018, barring congressional action. Trump was inaugurated as the 45th president of the United States on Jan. 20, 2017.